Have you ever fantasised about slipping into the skin of a WWI fighter pilot? If this is the case—rejoice because the fighter plane simulator Dogfight promises action galore in the multiplayer mode, at least according to the game's Market description. Find out what we make of it in today's review. Thanks to Christian for today's review! This application requires 10 MB internal storage and 35 MB on the SD card. If you find the role of a pilot during the Great War a bit daunting, why not try out the practice mode in order to get your bearings. You can choose a plane to fly (only one model is available if you're playing the test version), all of which feature different flight qualities, namely velocity, handling and armour. Once you've made your selection you can take off and start playing. In the first rounds this mainly means flying through hoops in order to practice your flying techniques. An arrow is meant to indicate the flight direction towards the next hoop, but the arrow wasn't always easily discernible, and at times it wasn't visible at all. Thankfully, the developers have included an in-game minimap to help lost pilots find their way to the next target. 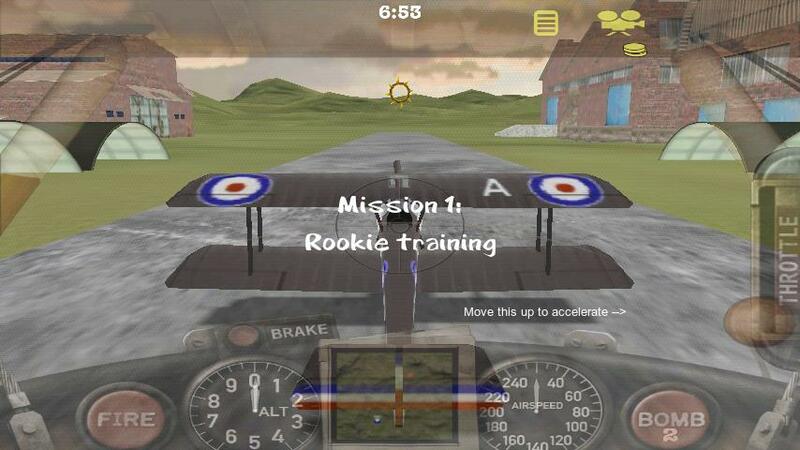 The second mission is all about finding the enemy aerodrome—but you're not actually told what to do until you arrive at the goal. This is a bit unfortunate and to my mind it would make more sense if the mission were displayed at the beginning of the level. Take down enemy air crafts using machine guns and ultimately destroy the enemy camp using heavy artillery such as bombs. Another goal is to keep your own camp safe. This involves team work, and you can communicate with your comrades via chat in order to determine who stands guard at the camp and who goes out on the prowl. This is where multi-tasking comes into play, because you will have to confer with your team mates whilst simultaneously defending your base or conducting bomb raids—not unlike what real fighter pilots must experience. The tilt controls work really well, even when you're typing out a message to your fellow fighter pilots, and luckily the chat window only takes up a relatively small portion of the display. Having said that, we don't recommend typing out messages right in the heat of the moment—you're better off waiting till you're in the clear, preferably coasting along without interruptions. In addition to the basic my, the free version has a series of additional multiplayer maps– including air craft carrier maps– but you'll have to deal with a time limit until you buy the full version. 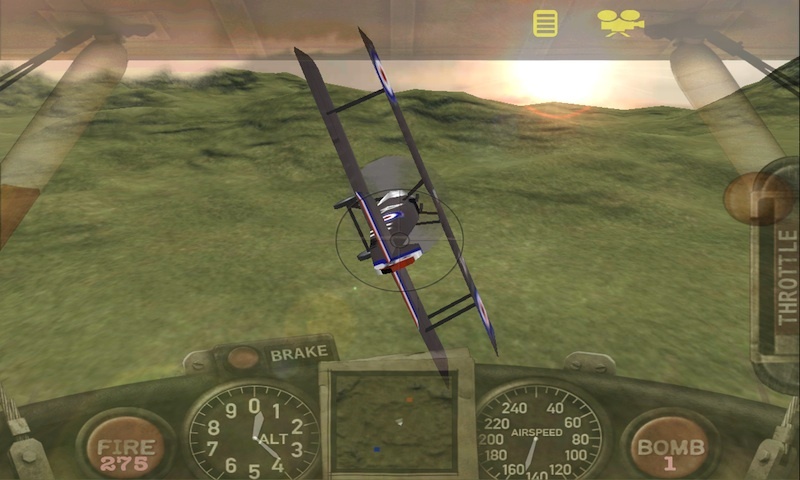 The camera perspective can be changed in either mode, that is to say that you can see what's happening from the pilot's point of view within the cockpit or via the virtual 3D camera behind the plane. If you go for the latter camera mode you will find that control elements are transparent, meaning you have a better view of what's happening around you. Speaking of control elements, they were designed in that nostalgic early 20th century look, which won't be everyone's cup pf tea, but then again you probably won't be interested in a WWI fighter simulator if you don't dig old-fashioned aviation design. The game has a great soundtrack which unfortunately only plays in the main menu. Once you begin to play you will hear engine sounds—very reminiscent of older computer games. In previous versions, there had been some problems with the FX, including sound loops cutting out but the developers have been able to root out the bugs. Developments like these are what we like to see at AndroidPIT. Go to settings to change control mode, graphics settings and language. Sound effects can also be de/activated. Dogfight has a lot of things going for it and, while we once had been a bit critical of the game, AndroidPIT can't find anything wrong with it in our latest test. 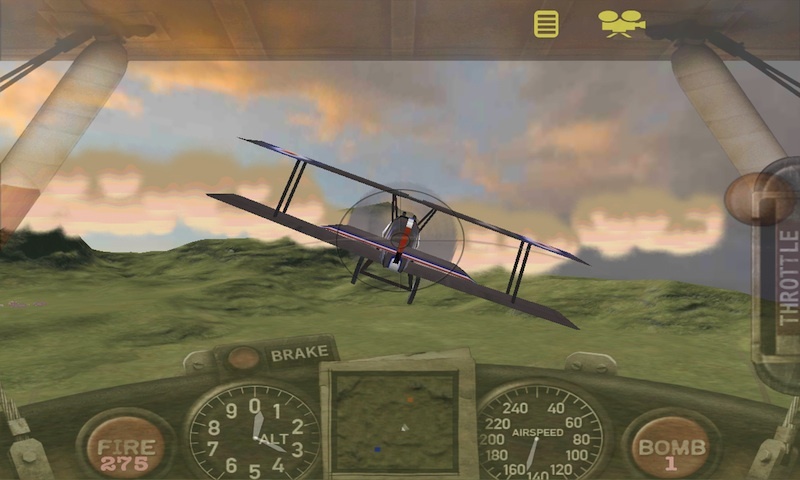 It's a fun reto-flight simulator, both exciting and addicitng. As far as the game's design and overall flavour goes, it's obvious that the developers invested a lot of time and thought into making it a really authentic WWI experience. The ground might look a little sub-par, like it was taken from a 90's flight sim. but the rest looks great. Clouds, rain, snow and more are a nice addition to the atmosphere. They also made the effort to include dynamic elemets that change as you play. Just give that same attention to the ground effects and you won't find any complaint from AndroidPIT! In version 4.4, the developers have also managed to work out the bugs in the graphics engine that hurt the games performace before. Controls on the other hand are and were pretty good. They may take a brief while to get used to, but the same is true for most games, especially simulators. There are two control modes to choose from: a classic mode using buttons on the display or tilt mode (be sure that your device is calibrated if you want to try out the tilt mode). 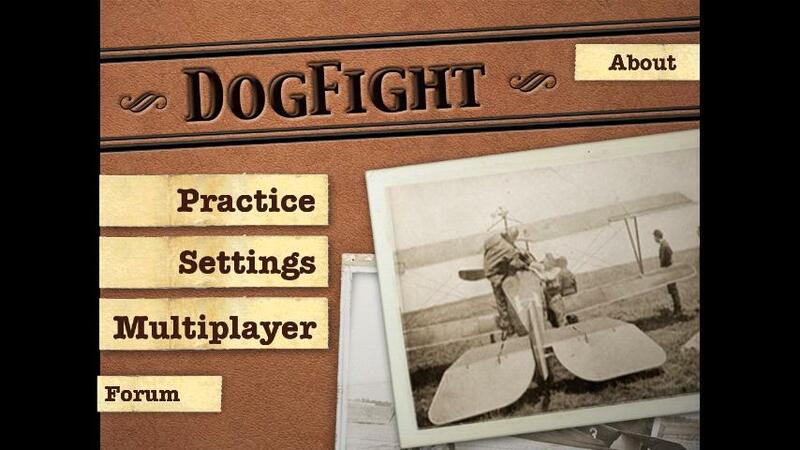 Dogfight has a lot of potential and with the latest updates is a nice addition to the Android game library. Loading times can sometimes take up to 40 seconds, which is a little bit longer than we'd like but nothing too dramatic. Dogfight did not crash on us but the 4.4 version of the app did hang and lag. We tested it with a Samsung Galaxy Nexus which isn't exactly a low-end device. Quite on the contrary: the Galaxy Nexus is very good at coping with complex graphics, so the lagging can't be written off as poor device performance. A free test version of Dogfight is available, but it contains only one map which isn't all too thrilling. A full version can be downloaded for EUR1,99 which is a bit much in our opinion because the graphics still could use a bit of polish. If you aren't a graphics fetischist then it might just be the dogfight sim for you. We passed the message on to him. I only translated the text so I didn't test the app myself. We're basing the rating on his review and user experience. anyway, I just wanted to say that the review has a mistake, which actually lowered all the stars. The speed part. The game is not slow, it's just displaying ads for 30 to 40 secs since you are using the free version. When you purchase it, it will remove the ads and load in less than 3 seconds.